Mitchell, W I (ed.). 2004. 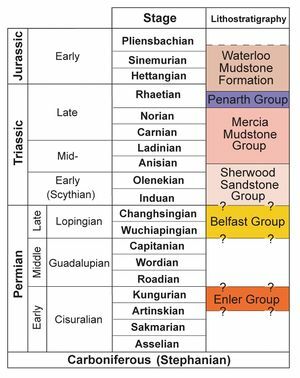 The geology of Northern Ireland-our natural foundation. Geological Survey of Northern Ireland, Belfast. 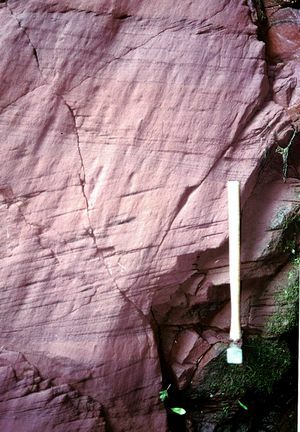 The Group consists of red-bed sediments, mainly pink to reddish brown sandstone and silty sandstone with brown mudstone accounting for up to one-third of the total thickness. Sedimentary structures include ripples, low to medium convolute and planar cross laminations (P948006), mudflakes, rain pits and desiccation cracks. The common occurrence of well-rounded (millet seed) sand grains suggests the influence of aeolian deposition. The Group is up to 648 m thick at Larne, about 300 m in the Lagan Valley and east Co.Tyrone, thins northwards to about 30 m on the Dalradian Highland Border Ridge and reaches over 500 m in the north, at Ballycastle (Port More borehole) and in the Magilligan borehole. Near the base of the Group is a unit up to 9m thick consisting of pink, cross-bedded, oolitic limestone and calcareous sandstone which is interbedded in the red sandstones (P948007). This is exposed in Drapersfield quarry [H 841 767], east of Cookstown  but has also been encountered in many of the deep boreholes drilled in the Triassic succession in Northern Ireland. The oolitic rocks represent a fluviatile facies. 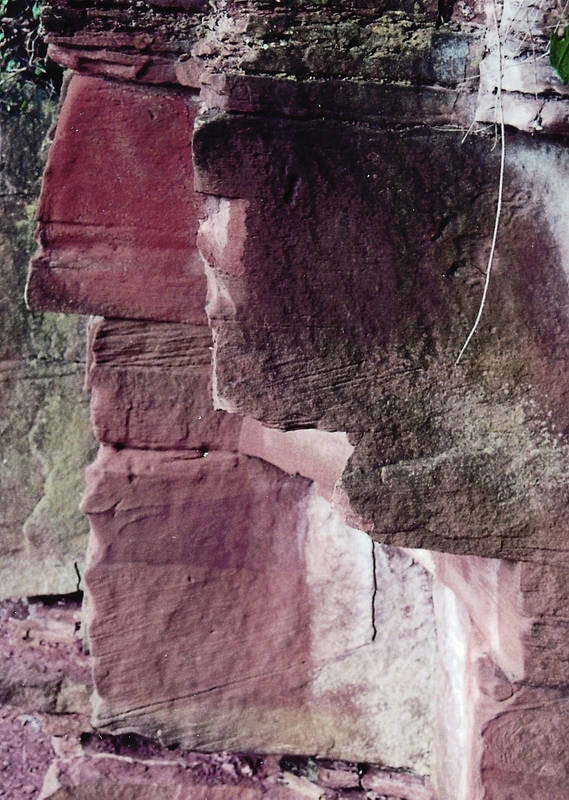 In the Ballycastle area of north Co. Antrim the Port More borehole (P947846) encountered over 500 m of the Sherwood Sandstone Group consisting mainly of reddish sandstone and pebbly sandstone, layers up to 12 m thick of brown mudstone and a 78 m thick conglomerate . Across Northern Ireland a conglomerate usually represents the base of the Sherwood Sandstone Group where it rests unconformably on older basement rocks. In Co. Armagh, up to 25 m of small pebble conglomerate rests unconformably on Carboniferous and early Palaeozoic rocks. 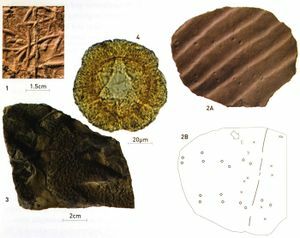 No stratigraphically useful macrofossils are found in the Sherwood Sandstone Group. However, a diverse, non-marine ichnofauna has been reported  from Scrabo, near Newtownards (P948008)  including invertebrate trace fossils (P948076) Fossil 1, ‘small and large arthropod (scorpion) trackways’ (P948076) Fossil 2 and the unique occurrence of a reptilian footprint, possibly of Chirotherium (P948076) Fossil 3. Near Dungannon in Co. Tyrone, the sandstones contain the crustacean Euestheria and, at one locality , examples of the fish Palaeoniscus catopterus. The Triassic age of the Sherwood Sandstone Group is based on sparse miospore assemblages. In the Larne No. 2 borehole Cycloverrutriletes presselensis indicates a late Early Triassic (Olenekian) age for the middle and upper parts of the Group (P947937). The presence of Stellapollenites thiergartii (P948076) Fossil 4 near the top of the Group in the Langford Lodge borehole indicates an early Mid-Triassic (Anisian) age . The Sherwood Sandstone Group was deposited in hot, continental conditions, mainly by fluviatile processes representing channel and overbank floodplain and lacustrine environments. Although the large-scale foresets at Scrabo developed as sand dunes dunefield sedimentary structures are relatively scarce elsewhere in the Group. Nevertheless aeolian conditions did prevail during deposition of the sandstones and provided the millet seed grains in fluviatile sediments. Conglomerates represent migrating channel deposits in a braided stream environment. The presence of desiccation cracks and breccias comprising curled flakes of mudstone is evidence for the existence of shallow lakes that periodically dried out. ↑ Parnell, J, Monson, B, and Buckman, J O. 1992. Excursion Guide: Basins and petroleum geology in the north of Ireland. In: Parnell, J (ed.). 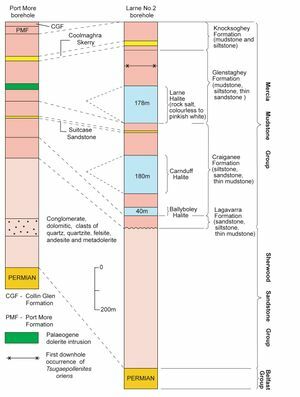 Basins on the Atlantic Seaboard: Petroleum Geology, Sedimentology and Basin Evolution. Geological Society Special Publication No 62, 449–64. ↑ Wilson, H E, and Manning, P I. 1978. 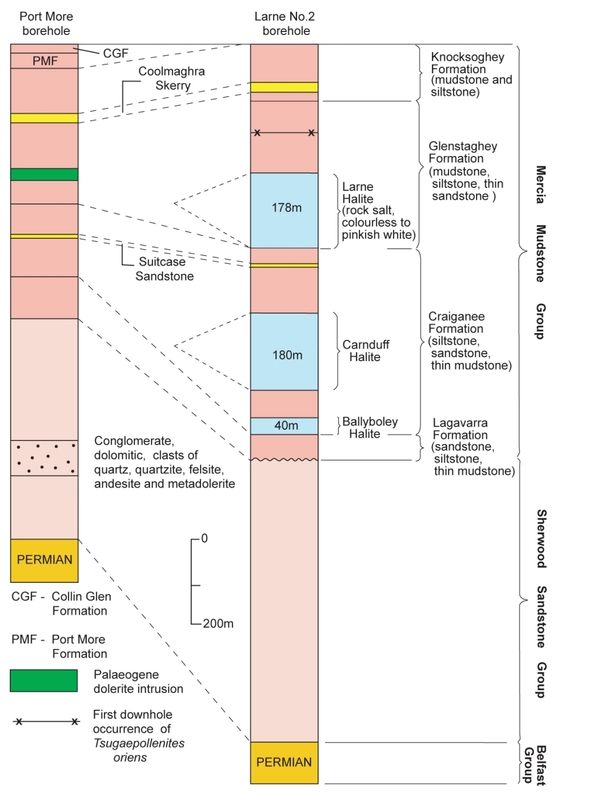 Geology of the Causeway Coast. Memoir of the Geological Survey of Northern Ireland, Sheet 7 (Northern Ireland). ↑ Buckman, J O, Doughty, P S, Benton, M J, and Jeram, A J. 1997/8. 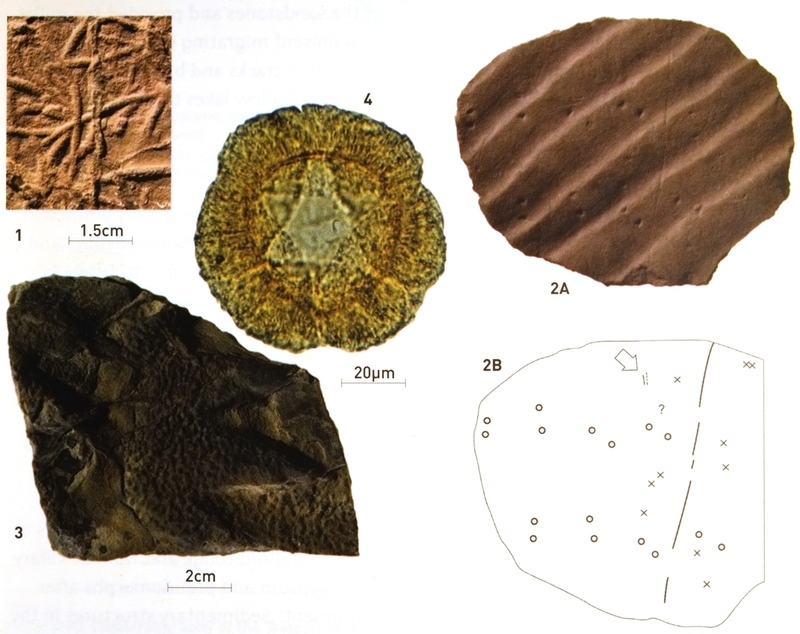 Palaeoenvironmental interpretation of the Triassic sandstones of Scrabo, County Down, Northern Ireland: Ichnological and sedimentological studies indicating mixed fluviatile-aeolian succession. Irish Journal of Earth Sciences, 16, 85–102. ↑ Smith, R A, Johnston, T P, and Legg, I C. 1991. Geology of the country around Newtownards. Memoir of the Geological Survey of Northern Ireland, Sheet 37 and part of sheet 38 (Northern Ireland). ↑ Fowler, A, and Robbie, J A. 1961. Geology of the country around Dungannon. Memoir of the Geological Survey of Northern Ireland, Sheet 35 (Northern Ireland). ↑ Warrington, G. 1995. 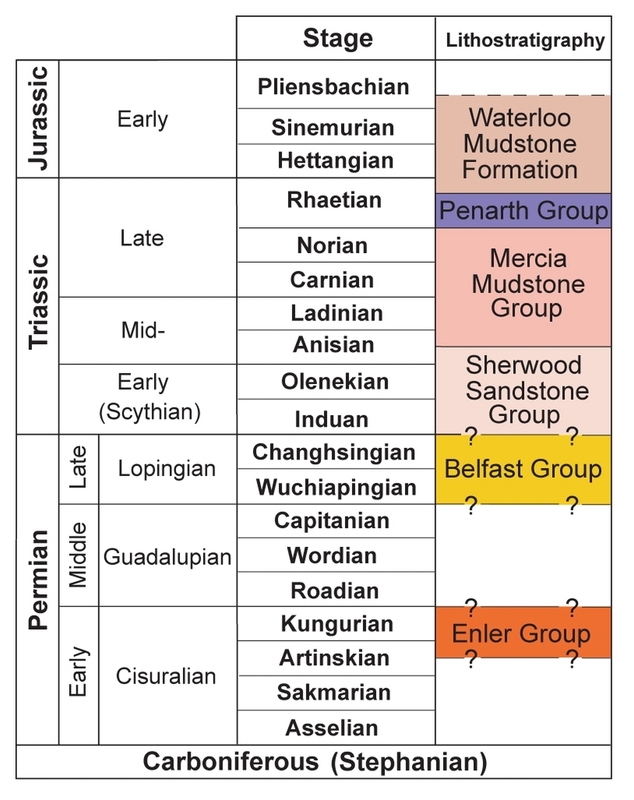 The Permian, Triassic and Jurassic in Northern Ireland: A palynological study with special reference to the hydrocarbon prospectivity of the Larne-Lough Neagh Basin. Geological Survey of Northern Ireland Technical Report GSNI/95/7. This page was last modified on 25 September 2017, at 14:00.